Any project, SEO or otherwise relies on accurate reporting to measure the effectiveness of the work being done, this enables us to refine the strategy and constantly improve your rank in the search engines. These reports are available and sent to our clients monthly, so you can measure the work being done. A cloud of secrecy often shrouds search engine optimisation work, however there is no big secret, so we make sure you are kept abreast of the results of all our work. This is the only way you can be sure that our work is effective. What Reports are Available ? Traffic Reports – These vary dependant on the size of the campaign, from simple visitor counts, to detailed reports including entry and exit pages and the time spent on the site. Activity Reports – Detailing all the work we have done and describing why, these reports are generally only made available to corporate clients due to the time involved in producing them. As an example some of our smallest projects receive a single monthly report with improvements in search positions against their given keywords, with traffic statistics, and comparisons to some of their competitors. Whereas our largest tourism seo client has requested multiple reports itemising many more elements of the campaign. We can provide reports to whatever level of detail you require. 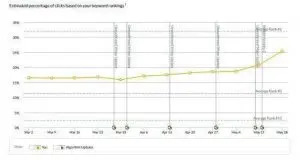 Heres an example of one of the graphs included on all our reports, this one shows the improvements over the course of 2 months when we updated a website to be responsive and added an SSL certificate. If you would like to discuss our full range of SEO services please call us free on 0800 0488832.